Orvieto is a city in southwestern Umbria, Italy situated on a 1000 meter high tufa cliff and is accessed by a funicular from the lower city. It lies roughly midway between Rome and Florence and is best known for its spectacular Duomo, its Etruscan ruins, and for it’s world famous Orvieto Classico wine. The site of the city is among one of the most dramatic in Europe as it rises above the almost vertical faces of tufa cliffs that are topped by defensive walls built of the same stone. This ancient city is one of the region’s oldest, and has been populated since Etruscan times. It was annexed by the Romans in 264 BC who all but destroyed the town, but Orvieto was finally revived in the middle ages when the town developed into a free state. Orvieto eventually came under papal control in 1348 after the town was devastated by The Black Death. The history behind why such a small town ended up with such an impressive Duomo is an interesting one. It is said that in the 1260s, a skeptical priest who doubted that the bread used in communion was really the body of Christ, passed through Bolsena (a few miles from Orvieto) while on a pilgrimage to Rome. During Mass there, the bread bled, staining a linen cloth. The cloth was apparently then brought to the pope, who just happened to be visiting Orvieto at the time. The pope felt that such a miraculous event required a truly magnificent church, and the Duomo we see today was designed and built. How to Get To Orvieto - Orvieto is well connected by train from Rome, Florence and Perugia. Travel time by train from Rome takes just about an hour. It is also easily accessed right off the A1 Superstrada that runs between Rome and Florence. Parking in the upper town is limited so it is usually best to follow the signs to the Porta Orvetiana parking lot and then take the funicular to the upper town. There’s also a large covered parking lot at Campo della Fiera in the lower town. Elevators and escalators help transport visitors to the historic center, which is closed to non-resident traffic. There are also limited parking areas around the edge of the upper town and a mini-bus runs through the town. The Medieval Duomo, or cathedral, is one of the most impressive examples of medieval architecture anywhere in Italy. Building started in 1290 but it took almost four centuries to finally complete it and it is thought that Arnolfo di Cambio the famous builder of the Duomo in Florence was given the initial commission. Work was completed by Lorenzo Maitani who designed the gorgeous facade that is embellished with mosaics that sparkle in the sunlight, bas-relief, and statues. The Gothic style interior holds frescoes by Fra Angelico and Signorelli and beautiful wooden choir stalls. To the right of the altar, the Chapel of St. Brizio features Luca Signorelli’s brilliantly lit cycle of frescoes depicting the Apocalypse (1499-1502). Once you step into the room you’re surrounded by vivid scenes of damnation and salvation. Only 25 people are allowed in this chapel at any time. To the left is the Capella del Corporale, where the linen cloth is kept in a golden reliquary. The cloth removed for public viewing twice yearly on Easter and Corpus Domini. The Archaeological Museum can be found in Piazza del Duomo, directly across from the Duomo, and is housed in Palazzo del Masrtino IV, one of the three buildings that make up the Palazzi Papali. This museum houses a good Etruscan collection including several bronzes and mirrors as well as Italic necropolises of the Orvieto area. Also housed in the Palazzi Papali is the Museo dell’Opera del Duomo, a museum dedicated to the cathedral whose exhibits include paintings and statues as well as other works of art that were once found within the cathedral. The Museo Emilo Greco is also found in Piazza del Duomo in the austere Palazzo Soliano. This museum displays the work of Emilio Greco (1913-1995), the Sicilian artist who designed the modern doors of Orvieto’s cathedral. His sketches and bronze statues show his absorption with gently twisting and turning nudes. The artful installation of his work in this palazzo, with walkways and even a spiral staircase up to the ceiling, allows you to view his sculptures from different angles. Also found in Palazzi Papali housed in the 19th century Palazzo Faina is the Museo Civico on the ground floor, and the Museo Claudio Faina above. The Museo Claudio Faina houses an extraordinary private collection of works gathered during the 19th century including Etruscan vases, and jewelry. Saint Patrick’s Well, or Pozzo di San Patrizio, located at the eastern end of Corso Cavour is one of Orvieto’s best known monuments and was built in the early 16th century. Designed by Antonio da Sangallo, it is considered an engineering marvel of it’s time. It’s double spiral staircases run along the sides of the well, 62 meters deep, without meeting. Each has 248 steps and is just wide enough for pack animals to descend and then carry water back up. The well also has a total of 72 windows. The underground passages, or Parco delle Grotte, are caves that were dug into the soft tufa beneath the city and have been in use since Etruscan times. During the Middle Ages, the network of passages grew larger and was used for water cisterns and pigeon breeding. This underground city is open to the public on walking tours arranged at the tourist office and on these tours you’ll see the remains of an old olive press, two impressive 130-feet-deep Etruscan well shafts, and the remains of a primitive cement quarry. See Orvieto Underground for details. Chiesa Sant’Andrea is one of the oldest buildings in all of Orvieto having been founded in the 7th century, and was rebuilt during the 12th and 14th centuries. Sant’Andrea was once considered the most important church in Orvieto as it was here that Pope Innocent III proclaimed the Fourth Crusade in 1201 and where Martin IV was crowned pope in 1281. 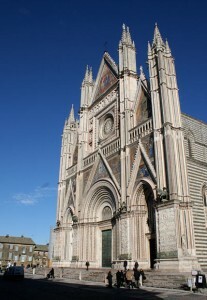 San Domenico, in Piazza XXIX Marzo, is the first building to display the unusual striped stonework that first appeared in Orvieto in the 13th century. This design was next used in the cathedral and later became a signature look for the city. San Francesco in Piazza dei Febrei, is the Romanesque church built for San Francesco and was founded in 1240, but has been altered many times over the years. The large church has a tufa facade with three arched doorways. One of the main works of art housed in this church is the 14th century wooden Crucifixion attributed to Maitani. Torre del Moro, towers 47 meters above Piazza Cavour, which is Orvieto’s main street, and is the highest point in the city. From the top of the tower there are incredible views over the valley and hills. The tower was named for the figure on the coat of arms of the Pucci, a local family. Albornoz Fortress is a Spanish castle raised at the orders of Cardinal Albornoz and can be found at one end of the upper town where an Etruscan temple once stood. The original fortress was torn down and this one dates from the mid-fifteenth century. The fortress is now a public garden with the entrance close to the top of the funicular. The Festa della Palombella held on Pentecost Sunday (the 7th Sunday after Easter) is considered the festival highlight in Orvieto and represents the depiction of the descent of the Holy Spirit upon the Apostles. It is celebrated on the steps of the Duomo and includes releasing an artificial “dove” which ignights a cart of fireworks. Festa del Corpus Domini is the celebration where the square linen cloth considered proof of the miracle is taken out of the chapel and displayed around town with a solemn procession. Umbria Jazz Festival comes to Orvieto between Christmas and the first of January. They sell the Orvieto card that includes major sites and museums as well as the bus and funicular. The card can also be bought at the railway station parking lot.